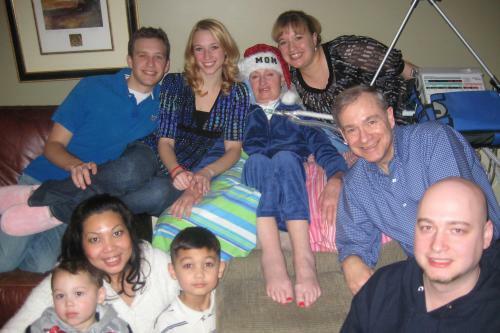 I thought that I would begin sharing personal ALS stories from my family’s experiences. We have had many personal times of triumph & many times of sadness. All of them have shaped my family into what it is today. Today I wanted to write about the time in our lives when my mom decided to get a tracheotomy and go on a ventilator. For a period of time (about 6 months) my sister, dad & I had been staying up around the clock in shifts to watch my mom sleep through the night. It had gotten to the point where we were all scared that she would choke on her phlegm…and nobody would be awake to help her. My mom was especially terrified with the thought of her life ending that way. She had so much fight left in her. Over the years we had heard so many negative things about going on a ventilator. Doctors were always very quick to share their opinions on my mom and all of us. They often suggested that a life would not be worth living with ALS & people always choose the fastest way out. We just didn’t believe that. We are a very unconventional family, and knew that we could do it. We figured that we had about a year before we had to make that decision, and then life took a tough turn for all of us. I was giving my mom breakfast in her room. My dad had gone to work & I believe that my sister was catching up on her sleep. Jenna had decided to take off a semester from college to help our family. At that point, our plan with her didn’t go much further than that. It was day-to-day around our house. My mom told me that she was having a hard time breathing. Now that I look back, these were probably the last words that I ever heard her speak. I checked her heart rate & it was racing at about 150. Her oxygen saturation was low, and I decided that we needed to go to the emergency room. I figured that I would take her thinking it was pneumonia & she just needed antibiotics. I called my dad & through the course of the conversation my mom began to look really distressed. My sister was up by now & didn’t know if my plan to take mom to the ER myself was a good idea. My dad decided to come home & when he arrived they made the decision to call an ambulance ( I was still thinking I could drive my mom myself & didn’t want to stir up the neighborhood). In the end the ambulance was the best idea. Plus you don’t have to wait in the waiting room…you get in right away! After arriving we spent about 6 hours sitting in a little room while they kept giving my mom Ativan to try to calm her heart rate & ran a bunch of tests. In the end, it was determined that my mom was fighting several infections in her blood stream & urinary tract. It was told to us later by my mom that she does not remember anything from the point we left her bedroom until several days later. Once she was checked into intensive care, it was determined that a breathing tube needed to be placed down her throat because her breathing was being compromised. My sister’s reaction to this news was devastating. I remember having to bring her down the hall while she sobbed & sobbed. I knew that my time to cry would come later, and I needed to stay strong for her. And besides, there was always the chance that we would be able to remove the breathing tube a few days later when my mom was better. Over the next couple of days my mom was heavily sedated because of the pain of the tube. Her dad had flown in from FL and her family was constantly in her room and at her bedside. Jenna and I were spending the nights sleeping in the hospital room with our mom on chairs that were not very comfortable. We let our dad go home & get much-needed sleep because he still needed to go to work since we didn’t know how long my mom would be in the hospital. His insurance has been wonderful….and boy did we need it! About 3 days later they tried removing her breathing tube…and that didn’t go well at all. Apparently a person with ALS has muscles that atrophy quickly when not in use. Since we were not able to remove the tube, we now had to made the dreaded decision. To trach or not to trach? Luckily we had been smart and created a living will for my mom before all of this happened. She had clearly made the decision (on her own might I add) that when the time came, a tracheostomy would be her decision. We were all in shock that the decision came so quickly, but we knew what had to happen. After the trach procedure had been done, we realized quite quickly, this trach thing isn’t so bad! All of the things we had previously worried about (like my mom choking) were quickly put at ease. We now had the ability to suction down her trach tube and pull out all of the gunky stuff that she had previously been terrified about choking on. And another huge plus, we were able to SLEEP AGAIN!!!! The ventilator that she is on will alarm to tell us if anything is clogging her airway or compromising her breathing. We suddenly had a lot of stress taken off of our shoulders & we had never even thought about the new benefits. One immediate downfall was the fact that my mother could no longer speak. We had to quickly learn a new method of spelling through blinking. My mom took to it right away & that is how we have spoken ever since. Once the tracheotomy had been done, we had to look at how to move forward as a family. Our next step was to convince the doctors & social workers that we could take care of our mom on our own. The medical company we were using said that they had never sent a patient home with family members versus going to a care facility. Over the next few days we learned how to use the ventilator, clean my mom’s trach tube & change her inner canula. We were determined to bring my mom home & take care of her. Another change that we made was moving a hospital bed into our living room so she could be in the center of all the action. It would no longer be possible to bring her upstairs since she was attached to a ventilator. Again, this turned out to be a good thing. My mom no longer felt secluded & we all learned to party around her. She always knows what is going on, and that is the way that she likes it! Overall we spent about 4 weeks in the hospital fighting infection & transitioning to life on a ventilator. It was a very emotional & sometimes terrifying time in our lives. Our world felt as if it was turned upside down over night, but in the end, the changes we made had a positive impact on everybody that lived at home. My mom has not been hospitalized since, and it has been about 3 1/2 years now. We take turns sleeping on the couch in the living room at night to be with her. Luckily our couches are amazingly comfortable & now looking a little worn out….but I love them! I get most of the nights of the week on the couch, but that is ok by me. Every night I sleep near my mom, I find the gentle breathing sound of the ventilator soothing. It is that sound that reminds me how thankful I/we are to still have her with us. She is such a strong and amazing woman. The ventilator decision was such a positive decision for her and my family. She has since seen my sister get engaged, helped plan a wedding, got to see her say her “I do’s, spent time with all of her family, seen all of her friends, she attends the ALS walk every year, was there for my dad when he lost his mother, was there for my uncle when he lost his wife to cancer, was there for one of her best friends when she lost her battle with breast cancer. And in the words of my mother, she has truly learned the meaning of the phrase “everyday is precious”. Thanks for sharing Kelly! I really admire your family for everything you guys have done and are doing for your mom.